Here's one of the brightest and best-designed Noah's Ark ornaments we've seen in some time! 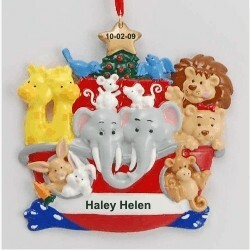 The baby's Noah's Ark personalized Christmas ornament is simply darling, and it even features a Christmas tree and star for the holidays. These kids ornaments personalized from Russell Rhodes include the child's name and a year added by hand in a kid-friendly font that differs from the one used in the photo for clarity. Loaded with adorable pairs of critters, the Noah's Ark and Christmas tree personalized ornament includes an attractive display cord already attached when it arrives in our plush, pretty velvet gift and storage bag.